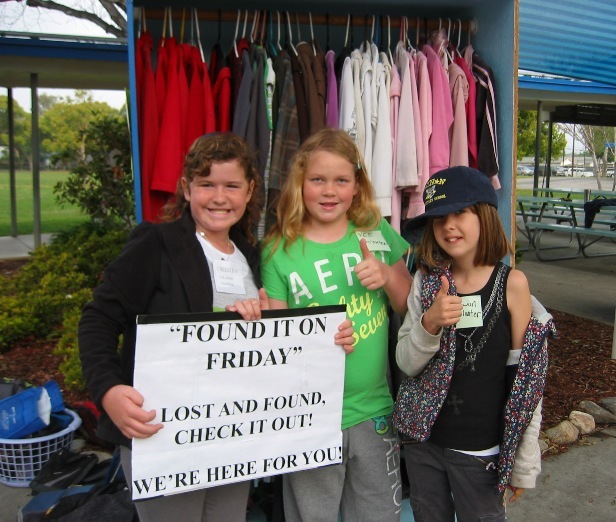 Sandee Rosse shares a Eureka (I found it) moment with two happy students, who found their belongings. Now that it’s spring, it’s only appropriate that this story is about a rose – Sandee Rose who is reuniting children with their lost jackets, sweaters, and backpacks with a unique lost-and-found program, Found It on Friday, which she started at Roynon Elementary School as a PTA project. Every Friday, she stands at the E Street entrance to Roynon, displaying the lost articles that students have left behind on the playground, in the auditorium and all those other places that only a kid could find. 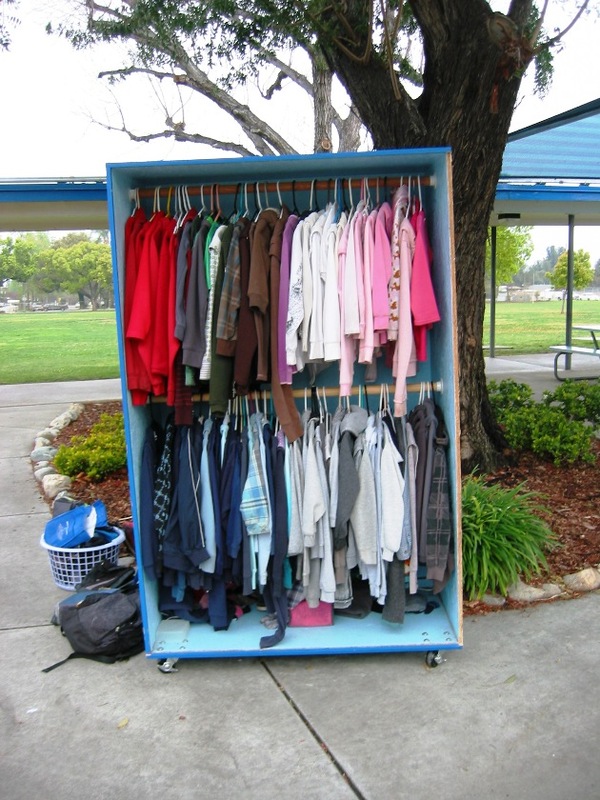 The stock of jackets, lunch carriers, backpacks and shirts is easy to spot because the unmarked belongings are sorted by color and hung in two rolling, wardrobe-style bins. Before launching the program, Sandee, whose granddaughter Chelsea attends Roynon, hopped on the Internet and researched other lost-and-found programs. She also came up with the catchy name, Found it on Friday. As a result of the program, she and her husband Steve, who often helps out, are seeing the smiles of lots of students and their parents who are only too happy to reclaim an expensive jacket or book bag that had been given up for lost. Moreover, the reclaimed articles literally return warmth to many children who often have to do without after losing their jacket or sweater. “It’s a big economic burden for some families to go out and replace that wrap,” Steve said. There’s no mystery as to how the kids lose their belongings. “It’s often cold in morning and hot in the afternoon, so the kids shed their jackets and forget about them,” Sandee said. From left, student volunteers Chelsee Colombo, Veronica Palmer, and Rowan Williams want to return all lost items to their proper owners. Sandee and Steve, however, haven’t forgotten about Roynon’s children. They also initiated a program whereby students mark their belongings with a “secret code (the student’s initials and room number). When a marked belonging is found, a note goes to the teacher to inform the student that missing item is in safe hands waiting to be picked up. Future Found It on Friday events are scheduled for April 13, April, 27, May 4, May 18 and May 25. Look closely, you just might spot your lost jacket, sweater or sweat shirt in the Found It on Friday storage bin.